During your stay in Barcelona, taxi will often be a preferred transportation means for you, whenever your destination is not within walking distance, and specially at night. 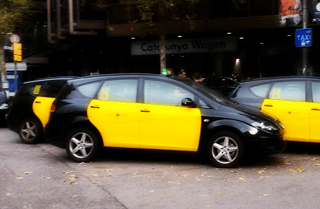 Taxis in Barcelona are black and yellow, what makes them easy to spot whenever you are. Plus compared to many other European cities, the taxi service in Barcelona is still quite affordable (despite Barcelonans complaining about their constantly rising fees). In Barcelona taxi stops are often located near hotels and tourist sites, but you can also hail them in the street, if they show a green light over their roof. However, they are not allowed to stop too close to a taxi stop: if there is one nearby, head there and ask who’s first: drivers wait for their turn in line. Taxis in Barcelona must show publicly what fee are they charging at the moment. Those numbers in the roof of a Barcelona taxi refer to that fee (weekday, holiday/nighttime/weekend, out of town…). That’s done for police control purposes, and locals don’t really care about them: forget about the numbers, and just look for a green light signaling that it’s available (numbers instead of green light means it’s taken). How many people can they take? Most taxis in Barcelona take upto 4 passengers. There are taxis in Barcelona that take upto 6 people, but they are hard to find. So if you are 5 or more you’ll have to split in two taxis for the ride. When I’m on one of my Barcelona taxi / subway tours and we need 2 cabs, I usually tell the first driver where to take half of my group, then I go on the second cab with the rest, and this way I make sure that both taxis will take us to the same place. How much do taxis in Barcelona charge? All taxis in Barcelona have a meter that shows exactly how much to pay. But as a guideline, most rides will be between 5 and 10 euros, depending on the distance (around €30 for an airport transfer). During nightime and weekends, expect it to be a couple of euro more. Keep an eye on the meter when approaching your destination, to make sure there aren’t sudden increases. There are supplements for airport/pier/AVE train station and Fira de Barcelona L’Hospitalet departures/arrivals, plus some special nights (New Years Eve, Saint John’s Eve…) Any other supplement might be a scam unless it is listed on a sticker in a back window – avoid taxis who don’t display them (they are more likely to be cheaters!). 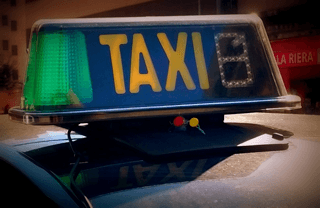 If needed, ask for help to your hotel bellman or note down the driver taxi license (displayed on the dashboard or in the back of the car) and present a complaint to the Metropolitan Barcelona Taxi Institute. Since 2017 all Barcelona taxis must be able to take credit cards. Just take into account that sometimes their machine might be broken, or there might not be enough network to make it work, or a credit card might be rejected. So make sure to have small bills to pay just in case, as the law only forces them to have change for upto €20 bills and you might get in trouble if you have a larger bill and they don’t have enough change. This have been my tips to make your experience using taxis in Barcelona pleasant and easy. Enjoy your ride! AND BONUS! How much do you tip a taxi driver in Barcelona? Do you tip taxis in Barcelona? It is appropriate to leave a few cents if you are happy with the ride. I usually round up to the next €0.50 or euro amount, but for an airport right it would be a couple of euros instead. Again, if the car was dirty, the driver not nice or he wasn’t driving safely, or if you think that he is cheating you somehow, DO NOT tip at all. BTW, you can learn more about tipping rules in Barcelona here. Now is your turn! 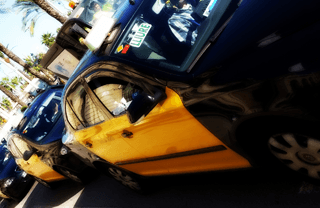 Have you ever used taxis in Barcelona? Share your Barcelona taxi experience on a comment below!